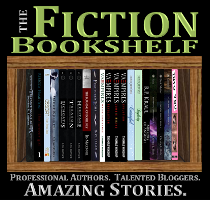 May 2015 Update Addendum – My Writing Year So Far – With A Chart! As I mentioned in my update a few days ago, I’m currently working on a new project that is still a little vague, but it’s something post-apocalyptic. 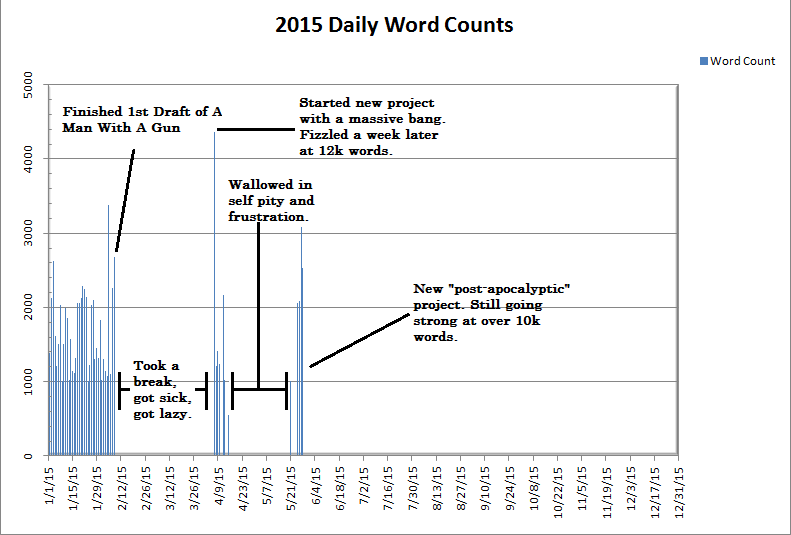 I also chattered on quite a bit about my goal of averaging 500 words per day this year and how that was coming along. I know I’ve mentioned the Excel spreadsheet that I use to track my daily word counts, and that it has a chart as well. I thought you folks might like to see how that chart looks so far this year. So, here it is, including annotations I added to explain what we’re seeing. The past few days have been productive, and it feels good. I think part of it is the excitement of a new project. I also think it has helped having a set start time to each writing session. Due to my nocturnal schedule, and being weird about what day gets credit for my word count if the writing session straddles the midnight hour, I’ve just been waiting until midnight to start actually writing. Having that set time to “clock in” as it were, solidifies the concept that “it’s writing time – now go write“. Also, I get to psych myself up in the time between getting home from the day job and when I start writing. Another nice thing is that there’s a little less pressure. When the last project hit the wall back in April it was very discouraging. But, I’ve had time to mull it over and I’m not so worried about that now. I know that chances are good that I’ll go back to it and finish it eventually – it’s just not ready yet. However, if it doesn’t ever amount to anything, and even if this new project dies as well, it’s okay. It’s all practice. It’s all experience. I think I do pretty well as a wordsmith, but we’re always working to get better. The reason I can be so cavalier about the investment of tens of thousands of words that may never see the light of day is because I know that I can produce projects that do make it through. I’ve talked before about how finishing A Man With A Gun was great, not just because it was a new novel finished but because I had proven to myself that the first novel wasn’t a fluke. Once can be luck, but twice is nice. Many authors only have one book in them. Nothing wrong with that, but I want more. Now I know that I have more in me. Lots more. This entry was posted in General and tagged A Man With A Gun, chart, Motivation, post-apocalyptic, word count. Bookmark the permalink. Reaching your goals are simple! Just include the words you write in your blog. LOL! I’ve been tempted to… But that smacks of cheating. Gotta be fiction.